A dummy doorknob is one that does not turn, latch or lock. They are typically used on closet doors, bi-fold doors and others that do not require a latch. 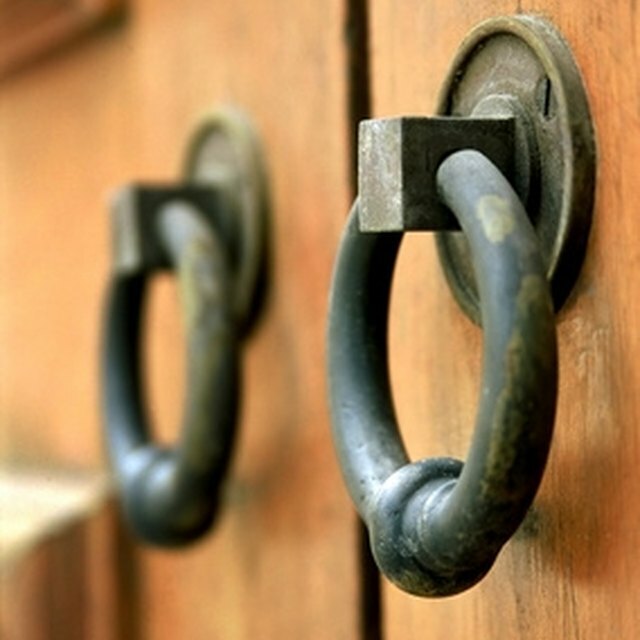 In general, dummy doorknobs are installed on doors with no hole bored for the doorknob. However, you can install a dummy doorknob on a pre-bored door with a little extra work. Choose your dummy doorknob. If you choose one that has a base plate that covers the entire bored hole, you can simply screw it to the door, covering the hole. If your knob does not cover the hole, go on to Step 2. Fill the pre-bored hole in the door with Bondo, Wood Bondo or wood putty using the putty knife. If your door is going to be painted, Bondo products are a great choice. If your door is stained, choose the wood putty instead. Ask your home improvement store for help if you are unsure as to which product is the best choice for your application. Let the Bondo or putty dry per package directions. Sand the Bondo or putty until smooth. Paint or stain your patch to match the rest of the door. If you happen to choose a doorknob with a faceplate large enough to cover the hole, you can look for a decorative plate to cover the hole on the other side of the door. If this is not an option, follow the directions for filling the hole.